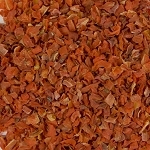 Why Use Dried Carrot Flakes? Say goodbye to those limp carrot sticks in your refrigerator drawer and hello to premium dehydrated diced carrots! Experience the convenience of having their fresh carrot flavor always at your fingertips. No more endless chopping to create that perfect stew! The vivid orange hue of dried carrot chips is appealing to the eye and good for them too! Getting your kids to eat their veggies has never been so easy! The next time you're making mashed potatoes, cook some dried carrot flakes and add them to the potatoes before mashing. The vibrant orange tint and sweet carrot flavor of these dried chips adds a unique variance to an everyday dish! Get creative and try other dehydrated veggies to create the color of your desire. Dehydrated carrot chips can be used to replace fresh carrots in most recipes. Carrot cake anyone? Expand your cooking options by trying some of our other dehydrated vegetables. Dehydrated peppers, dehydrated celery, dehydrated potatoes, and dehydrated onions, just to name a few, will help you prepare those restaurant quality meals in no time. Give 'em a try and you'll be rooting for them too! Not only are our dried carrots dices bursting full of beta-carotene, but dried carrot flakes are also full of many other nutrients important for optimal health. Whether you're a busy mom, an elderly grandparent, or an avid hiker, dehydrated carrots are here to make your cooking experience easy without sacrificing nutrition or taste. Polly won't be asking for crackers once she discovers the yummy taste of dehydrated carrot chips! Being clean and free of pesticides and additives means you can safely feed these dried carrots to your pet for added nutrition to their diet. That's why bird rescues, horse stables, pet shops and pet owners love our dehydrated diced carrots. Create your own custom mix with dehydrated carrots and freeze-dried fruits for your parrot, or dehydrated carrots and dehydrated peas for your turtle. Make the combination that best suites your pet and they're sure to live up to even the pickiest eaters. From turtles, lizards and small pets to birds and horses, dehydrated carrot chips are the way to go! Your bunnies will bounce for joy over these yummy dried carrot chips!